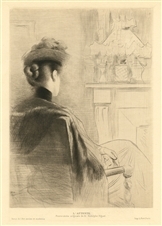 Rodolphe Piguet original drypoint "L'attente"
Medium: original etching and drypoint. This beautiful piece was executed by Rodolphe Piguet (sometimes spelled Piquet) in 1904 and was printed on laid paper by Louis Fort, and published in Paris in 1902 for the Revue de l'art ancien et moderne. Plate size: 9 1/2 x 6 1/2 inches (242 x 163 mm). Signed in the plate (not by hand).